This volume is THE definitive, completely up-to-date, reference work for ALL researchers and clinicians working in autoimmunity. Up-to-Date: This is a timely critical review of more than 100 autoantibodies by leading experts in their respective fields, and includes many recent references. International Experts: The 120 Chapters have been written by the top international cadre of authors who have provided structured, expert contributions. Comprehensive: A total comprehensive perspective on the processes which induce, inhibit or otherwise affect autoantibodies in humans. Useful to Researchers and Clinicians: Chapters generally include methods of detection, pathogenic role, factors in pathogenicity and genetics as well as clinical utility with disease associations and frequencies. The Uses of Autoantibodies. Acetylcholine Receptor Autoantibodies. Actin Autoantibodies. 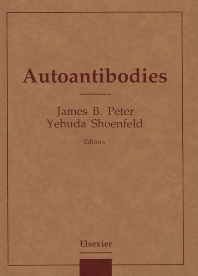 Affinity and Avidity of Autoantibodies. Alpha-Galactosyl (ANTI-GAL) Autoantibodies. Aminoacyl-tRNA Histidyl (Jo-1) Synthetase Autoantibodies. Aminoacyl-tRNA (other than Histidyl) Synthetase Autoantibodies. Antineutrophil Cytoplasmic Antibodies in Inflammatory Bowel Diseases. Antineutrophil Cytoplasmic Autoantibodies with Specificity for Myeloperoxidase. Antineutrophil Cytoplasmic Autoantibodies with Specificity for Proteinase 3. Antineutrophil Cytoplasmic Autoantibodies with Specificity other than PR3 and MPO (X-ANCA). Antinuclear Antibodies. Autoantibodies in Therapeutic Preparations of Human IgG (IVIg). Autoantibodies that Penetrate into Living Cells. Autoantibody Subclasses. &bgr;2-Glycoprotein I Autoantibodies. Beta-Adrenergic Receptor (and other hormone receptor) Autoantibodies. Bromelain-treated Erythrocyte Autoantibodies. C1 Inhibitor Autoantibodies. C1q Autoantibodies. Calcium Channel and Related Paraneoplastic Disease Autoantibodies. Calcium Channel Autoantibodies and Amyotrophic Lateral Sclerosis. Centriole and Centrosome Autoantibodies. Centromere Autoantibodies. Chromo Autoantibodies. Coagulation Factor VIII Autoantibodies. Coagulation Factor (excluding Factor VIII) Autoantibodies. Collagen Autoantibodies. Cryoglobulins. Cryoglobulins Secondary to Hepatitis C Virus Infection. Cytokine Autoantibodies. Cytoskeletal Autoantibodies. dsDNA Autoantibodies. Endomysial Autoantibodies. Endothelial Cell Autoantibodies. Fibrillarin Autoantibodies. Fibronectin Autoantibodies. 56-kd Nuclear Protein Autoantibodies. Filaggrin (Keratin) Autoantibodies. Ganglioside Autoantibodies. Gliadin Antibodies. Glomerular Basement Membrane Autoantibodies. Glutamic Acid Decarboxylase Autoantibodies in Diabetes Mellitus. Glutamic Acid Decarboxylase Autoantibodies in Stiff-Man Syndrome. Glycolipid (excluding Ganglioside) Autoantibodies. Golgi Apparatus Autoantibodies. Granulocyte-Specific Antinuclear Antibodies. Heat Shock Protein Autoantibodies. Heparin-Associated Autoantibodies. Heterophile Antibodies. Hidden Autoantibodies. Histone (H2A-H2B)-DNA Autoantibodies. Histone Autoantibodies other than (H2A-H2B)- DNA Autoantibodies. Hormone Nonpeptide Autoantibodies: THYROID. Hormone Peptide Autoantibodies. Human Antimouse Antibodies. Idiotypes and Anti-Idiotypic Antibodies. IgA Autoantibodies. IgE Receptor Autoantibodies. Insulin Autoantibodies. Interferon-Inducible Protein IFI 16 Autoantibodies. Islet Cell Autoantibodies. Ku and Ki Autoantibodies. Liver Cytosol Antigen Type 1 Autoantibodies. Liver/Kidney Microsomal Autoantibodies. Liver Membrane Autoantibodies. Lupus Anticoagulant. Lymphocytotoxic Autoantibodies. Mi-2 Autoantibodies. Mitochondrial Autoantibodies. Mitotic Spindle Apparatus Autoantibodies. Molecular Mimicry. Myelin-Associated Glycoprotein Autoantibodies. Myelin Basic Protein Autoantibodies. Myocardial Autoantibodies. Natural Autoantibodies. Nephritic Factor Autoantibodies. Neuronal Autoantibodies. Neuronal Nuclear Autoantibodies, Type 1 (Hu). Neutrophil Autoantibodies. Nuclear Envelope Protein Autoantibodies. Nucleolar Autoantibodies. Nucleosome-Specific Autoantibodies. Other Autoantibodies to Nuclear Antigens. p53 Autoantibodies. Parietal Cell Autoantibodies. Pathogenic Mechanisms. Perinuclear Factor (Profilaggrin) Autoantibodies. Phospholipid Autoantibodies - Cardiolipin. Phospholipid Autoantibodies - Phosphatidylserine. Platelet Autoantibodies. PM-SCL Autoantibodies. Proliferating Cell Nuclear Antigen Autoantibodies. Purkinje Cell Autoantibodies, TYPE 1 (Yo). RA-33 (Heterogeneous Nuclear Ribonucleoprotein Complex) Autoantibodies. Recombinant Autoantigens. Red Cell Autoantibodies. Reticulin Autoantibodies. Retinal Autoantibodies. Retroviral Antibodies. Rheumatoid Factors. Ribosomal Autoantibodies. Ribosomal P Protein Autoantibodies. RNA Polymerase I-III Autoantibodies. Signal Recognition Particle Autoantibodies. Silicate and Silicone Antibodies. Skin Diseases Autoantibodies. Smooth Muscle Autoantibodies. Spliceosomal snRNPS Autoantibodies. SS-A (Ro) Autoantibodies. SS-B (La) Autoantibodies. Steroid Cell Autoantibodies. Striational Autoantibodies. Thyroglobulin Autoantibodies. Thyroid Peroxidase Autoantibodies. Thyrotropin Receptor Autoantibodies. Topoisomerase-I (Scl-70) Autoantibodies. Tubular Basement Membrane Autoantibodies. Tyrosinase Autoantibodies. Xenoreactive Human Natural Antibodies.